The new millennium might have given us a lot in terms of material pleasure and ease of living life with even more than required. But the one aspect of life that has unfortunately suffered in the last two decades has been the loving warmth within the family members, the closeness between the siblings, the joy of sharing and caring for each other and the art of living together which was once the key element of our life in India. Particularly the childhood of our kids, their bachpan has actually suffered the most due to the fast changing environment, abundance in means of entertainment and hundreds of options of spending their time creating a big chaos. In fact such is their involvement in these technology based engagements or gadgets that they even find difficult to believe the kind of life we all used to live before 2000 (before late-90s to be specific) without any mobile phones, 24 hours television, hundreds of channels and above all the Internet. 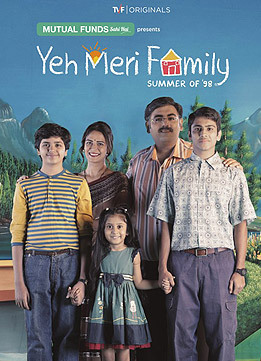 Thankfully YEH MERI FAMILY is here to take us back to those times of the mid or late 90s like a time-machine. And I am truly glad that this web-series got made, making us realize what we all actually used to be and what we have sadly become in the last two decades to be honest. A true to life, emotional, adorable drama created by Sameer Saxena and written by Saurabh Khanna, this is one of those web-series which you should ideally be seeing as your next, keeping aside all the other recommendations you might have noted in your diaries. And the key reason for the strong recommendation is that this will not only take the elders of the home on to a nostalgic trip back to the 90s, but would also teach the present kids and teenagers a lot in a very positive sense about the actual life. Giving you an idea, it recalls the times when brothers used to fight with each other for ownership over small things, how books and music used to be two essential elements of our daily living, how time (especially summer holidays) used to be spent playing games in the ground, reading comics, listening songs and indulging in a lot of physical activities. And how one had to seriously think about the ways to pass the day, instead of repenting on what could have been done in the last many hours. In other words, the life depicted in the series would certainly be an eye-opener for many who might have only heard about such things from their friendly elders. Fresh as the morning breeze, the series has an amazing cast and highly relatable performances from all, particularly the kids who are simply outstanding in their individual acts making it look so real. Undoubtedly one of those rare creations, which can specifically be quoted for its exemplary work by the young teenage actors. Set in the late ‘90s in Jaipur, YEH MERI FAMILY is a 7 episode series (in its first season) making the best use of the hit Hindi film music of those times too along with a few original, soothing songs. Told through the perspective of a school going kid it has an appealing style and all interesting episodes, with the two dealing with the father and the separation of brothers - the most emotional and impressive ones. Without falling for any gimmicks or forced added attractions, the series wins over the viewer with its simplicity and its extremely difficult to make a winner remaining so simple, strongly reminding you of the magic witnessed in all Hrishikesh Mukherjee films. It talks about ordinary families and still presents its so elegantly, yet again pointing towards the importance of writing addressing the present mainstream Hindi film-makers. Among the very few downers, I personally felt the charcter of mother and the kid sister getting a sort of step treatment resulting in an all boy-like show. Somehow the mother's perspective remained missing along with the little daughter of the family, which ideally should have been there in a dedicated episode. May be they have intentionaly saved the two for the second season. So overall, this can easily be called the modern day MALGUDI DAYS as rightly described by my FB friend Anilkumar in his comment. So don’t miss it at any cost, as we rarely get to see such family web-series (focusing on the kids), entertaining and teaching us some essential lessons of life with an amazing, natural ease. Thanks a ton sir for this wonderful write-up..
Rabindranath once said about short stories - it's something which will make you ask for more and you will feel that the end is not an end ( I read this line some 10 times and feel that it's near what the Great soul said in Bengali.. Pls pardon me for not been able to justify His words while trying to translate).. However this is what I felt after watching all the 7 episodes and the same can be said for your write-up too sir. The pleasure is really mine Avik. And thanks a lot for your constant support and love. True that, it is actually one of the best series ( or life experience) that I had come across a few months ago. Can't wait for the next season. It certainly is without any doubt. Thanks for visiting and writing in Gobindpreet.